In a bowl, whisk the oil, garlic, lemon zest and juice, rosemary, fennel seeds and pepper. Rub the mixture all over the chicken, inside and out. Let come to room temperature. Preheat the oven to 400°. Twist the wings of the chicken behind the back and tie the legs together; set breast side up in a roasting pan. Season all over with salt. Roast for about 55 minutes, until the juices run clear when an inner thigh is pierced. Transfer to a carving board and let rest for 10 minutes. 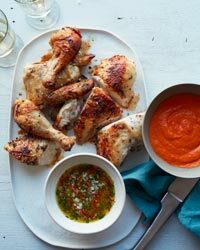 Cut the chicken into 8 pieces and serve with the Wasakaka and Piri Piri Sauces. Rich, savory roast chicken pairs well with full-bodied Chardonnay; this lemony dish is nice with a bright white Burgundy.